Cry baby: why is my baby crying? Why do babies cry? In short, newborns cry to communicate. Remember, newborns cannot talk. They can’t even smile back at you until around six weeks of age. Need to be changed –I never really believed this reason before I had my twins. My firstborn couldn’t have cared less if he was wet and could nap right through a really poopy diaper. Then I had my twins. I was amazed that their crying stopped if I changed the tiniest bit of poop or a wet diaper. Go figure. Are bored. Perhaps she is tired of the Mozart you play and prefers some good hard rock music instead. Maybe she wants a car ride or a change of scenery. Try moving her to another room in the house. Feel pain. Search for a piece of hair wrapped around a finger or toe and make sure she isn’t out-growing the elastic wrist or ankle band on her clothing. Need to be swaddled. Remember a fetus spends the last trimester squished inside of her mom. Discovering her own randomly flailing arms and legs can be disconcerting to a newborn. Need to be UN-swaddled. Hey, some like the freedom to flail. Need to be rocked/moved. Dr. Lai’s firstborn spent hours tightly wrapped and held by her dad in a nearly upside down position nicknamed “upside-down-hotdog” while he paced all around the living room. Need to burp. Lay her down for a minute and bring her up again to see if you can elicit a burp. Are gassy. Bicycle his legs while he is on his back. Position him over your shoulder so that his belly presses against you. You’d be gassy too if you couldn’t move very well. The gassy baby is a topic for this entire post– talk to your doctor for other ideas. Are sick. Watch for fever, inability to feed normally, labored breathing, diarrhea or vomiting. Check and see if anything is swollen or not moving. Listen to his cry. Is it thin, whimper-like (sick) or is it loud and strong (not so sick)? Do not hesitate to check with your pediatrician. Fever in a baby younger than eight weeks old is considered 100.4 degrees F or higher measured rectally. A feverish newborn needs immediate medical attention. What if you’re certain that the temperature in the room is moderate, you recently changed his diaper, and he ate less than an hour ago? Walk outside with your baby– this can be a magic “crying be gone” trick. Fresh air seems to improve a newborn’s mood. Offer a pacifier. Try many different shapes of pacifiers. Marinade a pacifier in breast milk or formula to increase the chance your baby will accept it. Pick him up, dance with him, or walk around the house with him. You can’t spoil a newborn. Vacuum your house. Weird, but it can work like a charm. Place him in a baby frontal backpack or in a sling while cleaning. Try another feeding, maybe he’s having a growth spurt. When all else fails, try putting him down in his crib in a darkened room. Crying can result from overstimulation. Wait a minute or two. He may self-settle and go to sleep. If not, go get him. The act of rescuing him may stop the wailing. If mommy or daddy is crying at this point, call your own mom or dad or call a close friend. Your baby knows your voice and maybe hearing you speak calmly to another adult will lull him into contentment. Call your child’s health care provider and review signs of illness. If you feel anger and resentment toward your crying baby, just put him down, walk outside and count to ten. It is impossible to think rationally when you are angry and you may hurt your child in order to stop your frustration. Seek counseling if these feelings continue. 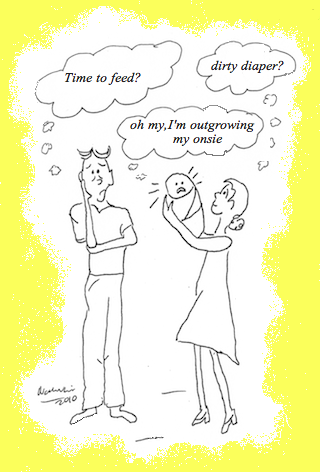 Now for the light at the end of the newborn parenting tunnel: the peak age when babies cry is six weeks old. At that point, infants can cry for up to THREE HOURS per day. Babies with colic cry MORE than three hours per day. (Can you believe people actually studied this? I am amused that Dr. Lai won a prize in medical school for a paper on the history of colic). By three months of age crying time drops dramatically.